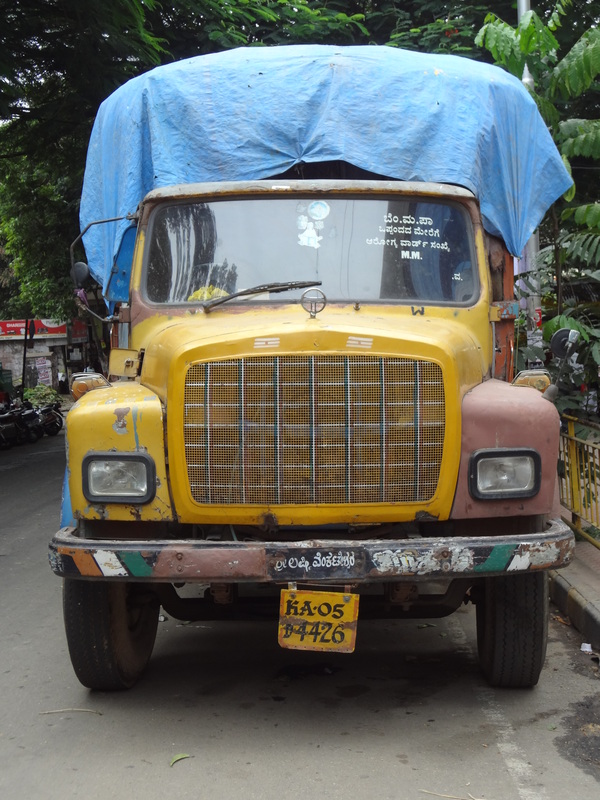 Even though I am winding up my book project ‘Sound Horn Okay’, I don’t seem to be done with Indian trucks. I want to keep taking pictures of all the various forms. I’m thinking my next project will be large wood cuts of truck ‘portraits’. 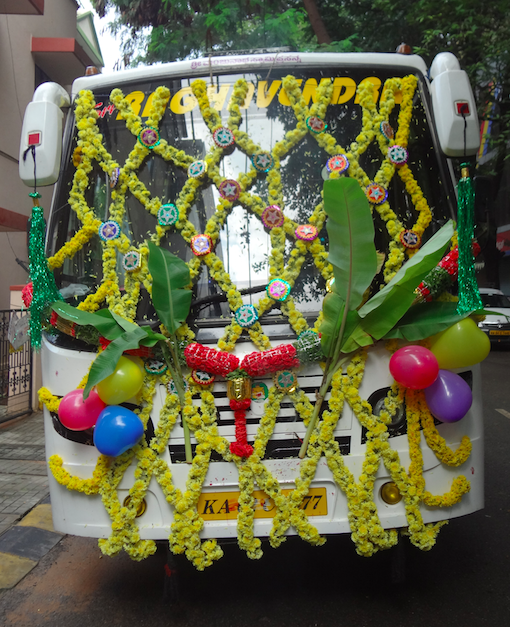 Above is a bus that is getting a blessing for Ayudha Puja, a holiday when people bless the tools of their trade (originally weapons). There are garlands full of roses, the obligatory banana stalks and an incense stick in the grill. It looks beautiful and harmless right? Well until you realize they drive around like this for days. I don’t know how the driver can possibly see out the window properly. 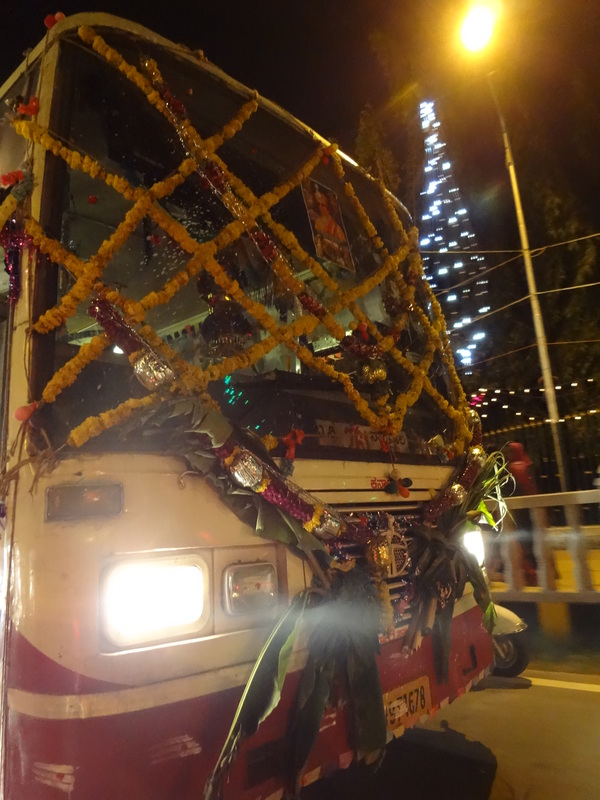 The public bus below was driving around Mysore Palace at night. 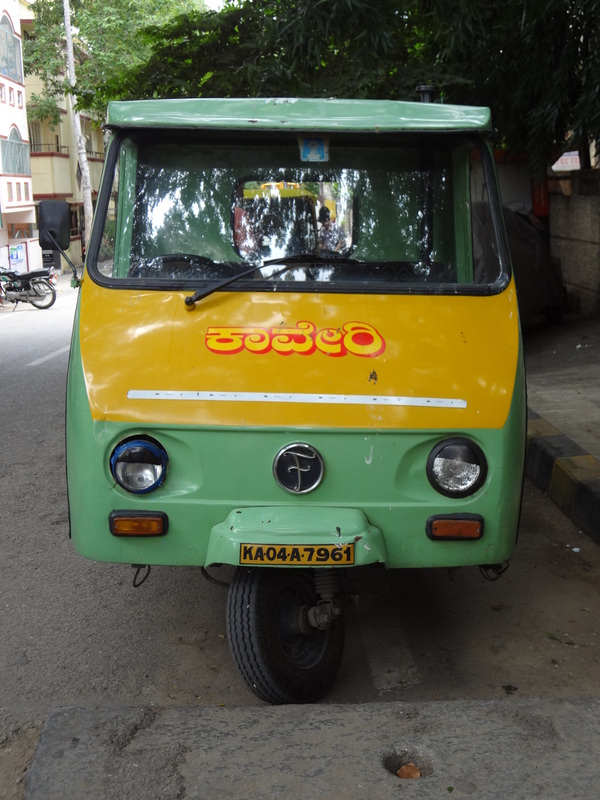 It even has a picture of the King of Mysore smack in the middle of the windshield. I love the lorries best. Even when the decorations are minimal, there are always some interesting details. A small Ganesha sticker or something hanging off the front (that looks like a thick coil of hair) for good luck. I’m told these often include a lime or sometimes even a shoe. Of course I like the hand painted patterns and images best, but all the layers of decoration are interesting. Most people have images of their religious figures, Hindu Gods and Sai Baba, Jesus and Mary, Islamic text and 786 (Allah number), but many also have decals of Bollywood stars. I see many cows, lotus flowers and demons. 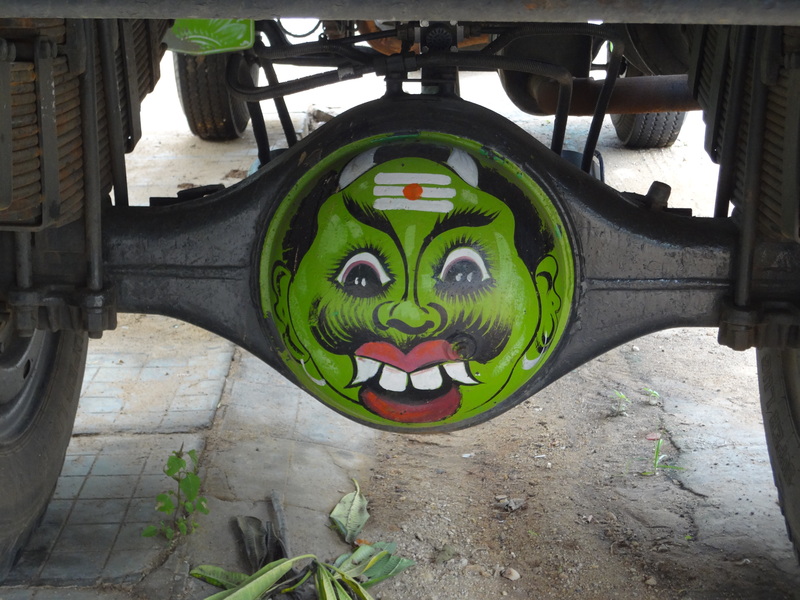 A favorite of mine is the demon, painted on the ball joint in the middle of the rear axle, on the lorries. 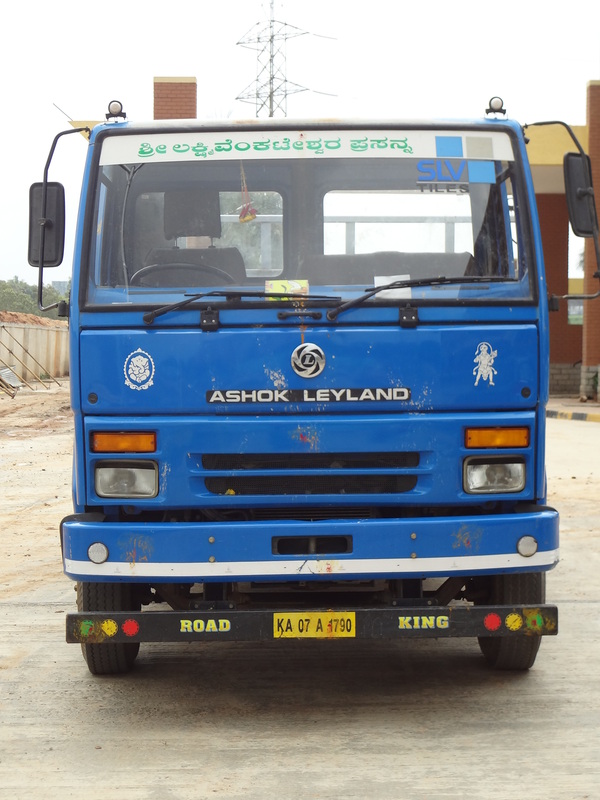 The header on the top of the lorrie cab is often the name of the family deity. Underneath in the oblong windows there might be names of people in the family. 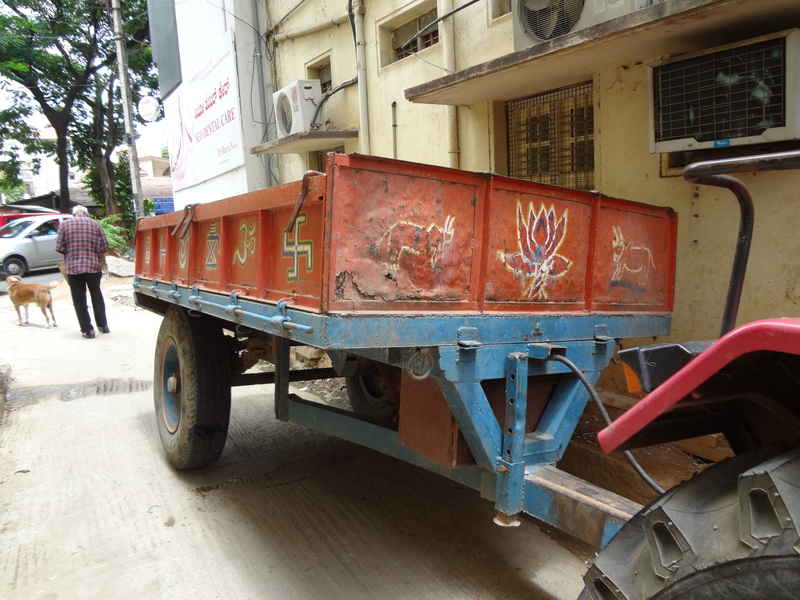 Many lorries are privately owned and they are tricked out in the same way you might decorate a home. If a driver takes long hauls, these trucks are second homes. Some have messages for the road like ‘Sound Horn Okay’, ‘Stop Signal’ or ‘Horn Please’. Others have inscriptions about deeper subjects like population control ‘We Two, Ours One’, meaning couples should have only one baby. 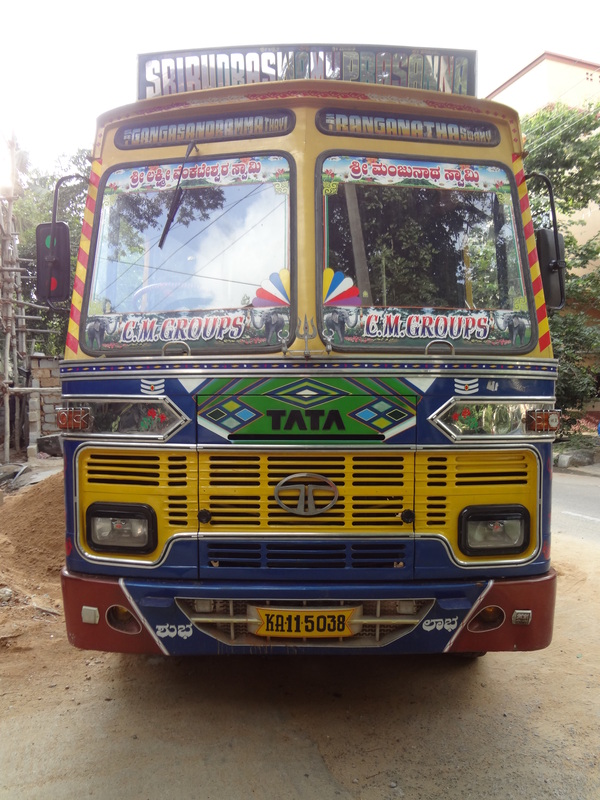 The next truck is pretty simply decorated, just a couple of gods (Ganesha and Hanuman) on the front, but I love the ‘Road King’ stenciled on the bumper. 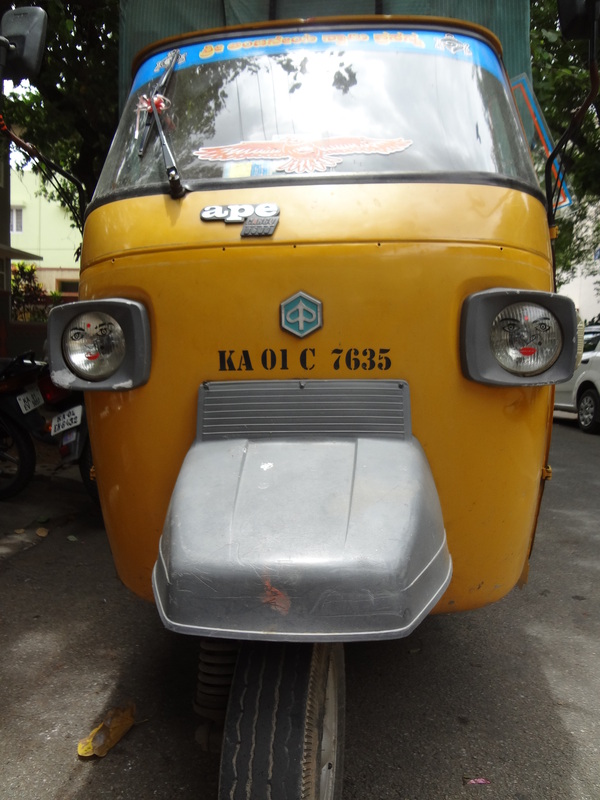 The three wheeled goods carriers have lots of personality. This one has faces of women painted on the headlights. These are referred to as ‘Apes’. 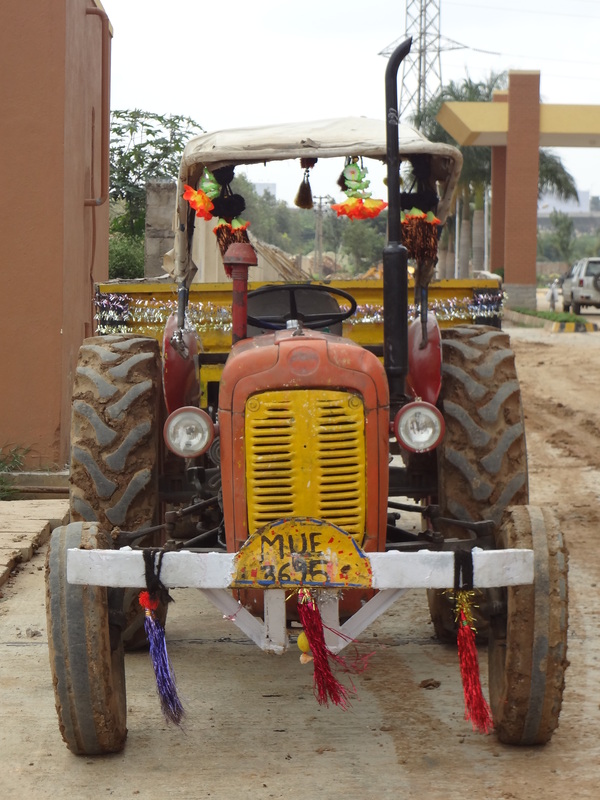 The tractors are always fantastic. They drive on the road like any other vehicle and are used mostly in construction. Almost every one hauls a beautifully painted trailer behind it. 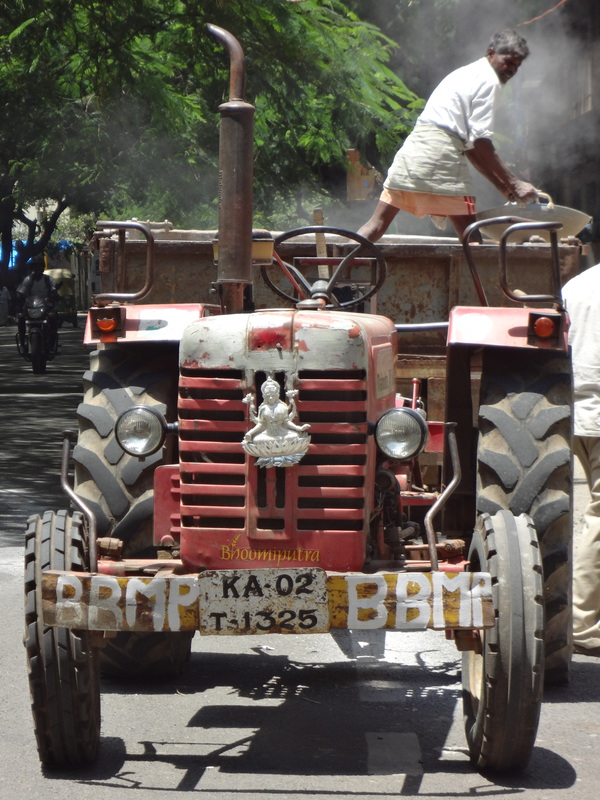 This tractor below was doing some road repair in front of the Reliance Market at the corner of our street. 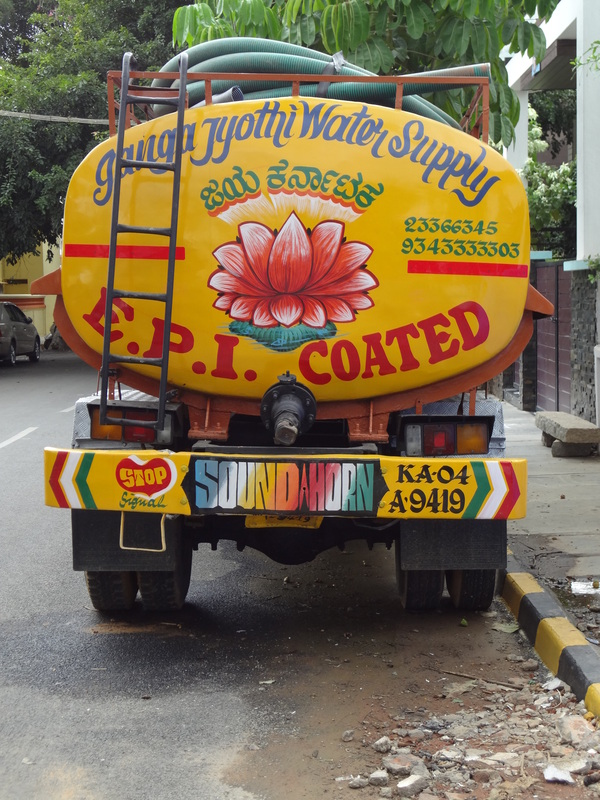 BBMP stands for Bruhat Bangaluru Mahanagar Palike, which is the Bangalore Municipal Department. Bhoomiputra means ‘Son of the Earth’ and Lakshmi hangs on the grill above. 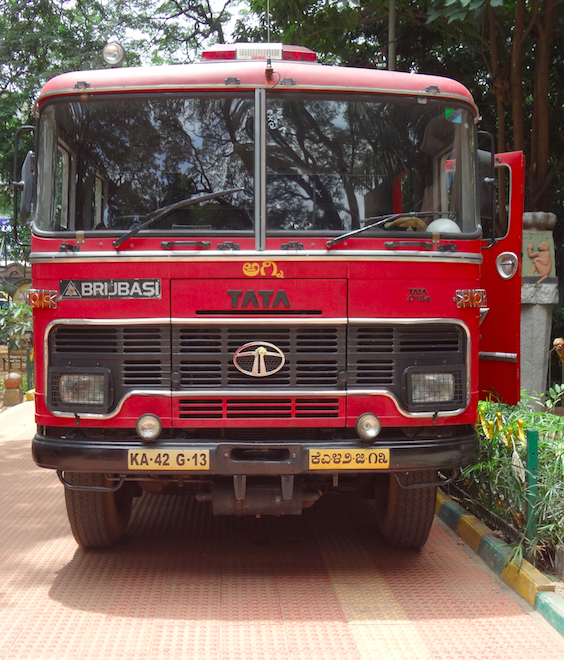 And the last truck is a Bangalore Fire Truck. I took this picture just for Ashwin. The guys inside the truck were looking quizzical.